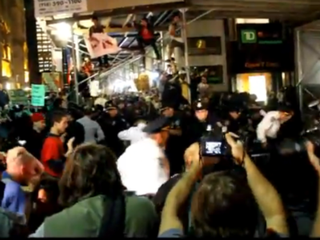 VIDEO: Police Brutality Against Wall St. Protesters? As the Occupy Wall Street protests intensify, so do allegations of police brutality against the participants. But it's not just the demonstrators' word against the cops'. Thanks to cellphone videos, you can assess the conduct of law-enforcement officers for yourself. In one, posted by the OccupyWallStNewYork Twitter account, a police officer says he wants to "beat" Occupy Wall Street protesters and wants his "little nightstick" to "get a workout tonight, hopefully." Then he pantomimes a beating. In another, titled "Cops Beating People Up at Occupy Wall Street," an officer is seen keeping the crowd at bay with the use of his nightstick as people around him scream. Watch both videos here, courtesy of Mediaite. In other news: Legal Scholar Derrick Bell Dead at 80.